Two steps forward, one step back for the <i>Madden</i> series. Two steps forward, one step back for the Madden series. Let people choose backstories for their teams, much as they choose them for their characters in certain RPGs. You could have “reigning champs”, “fading band of superstars”, “up-and-coming”, “rebuilding” or “plucky underdogs”, just for a few examples. One new element is the addition of storylines which are present for both coaches and players. For example, when choosing to be a “player”, you’ll also select from options like whether they were a first round draft choice or went undrafted. This not only affects initial ratings and play time but also expectations. Those who start as “undrafted” will have lower expectations and easier goals to achieve but understandably less playing time to do so. Cool. However, I’m still done with the whole Madden thing. I feel like I’ve pretty much mastered it, and the news that there’s not going to be any player editing allowed in the new version really sealed the deal for me. 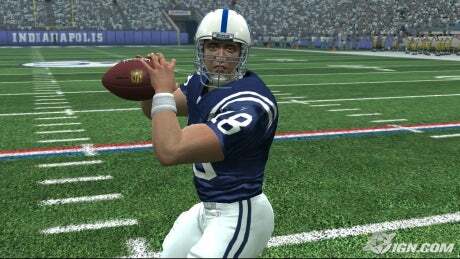 (For crying out loud EA, has Peyton Manning–or indeed, any quarterback–ever worn this facemask?) So, I won’t be getting it this year. The new physics engine does look cool, though.